Your petition says 58,500 homes are to be “privatized”. Surely this is incorrect. Hi Barbara, We have put that number because we aren’t confident that the whole portfolio is not up for sale. First they said “only 22 homes”. Now they want to sell another 1000, and are planning to eventually sell all stand-alone units. At this point, we don’t think anything is safe. Thank you for your comment! I live in a geared to income cooperative housing. I cannot afford privatized housing. My rent is reduced by 30%. I live in Mississauga. Will I be affected? Hi Rainerio! Thank you for your comment. 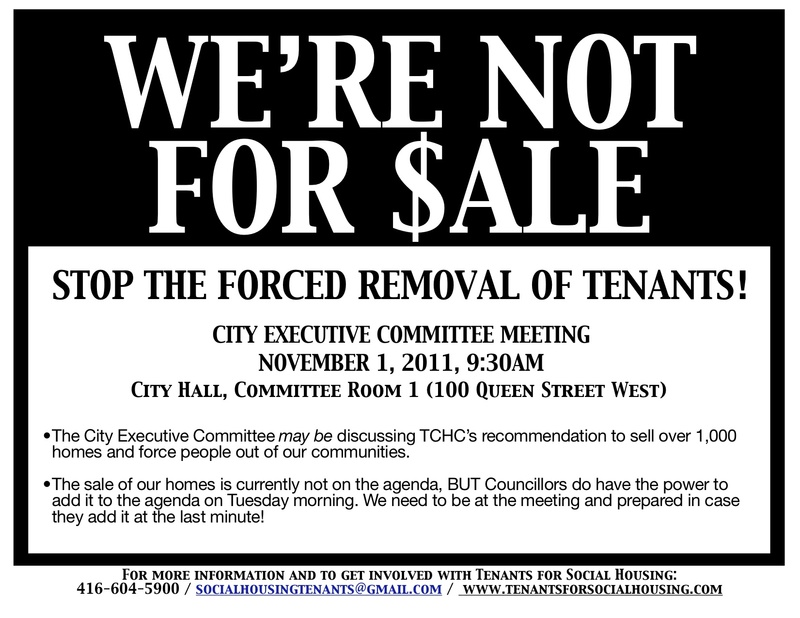 The sale proposed right now is for TCHC homes in the City of Toronto. If you live in Mississauga, your home is not included in the proposed sale. However, as a tenant of subsidized housing, we hope to have your support against this attack on the INSTITUTION of social housing. Tenants for Social Housing is fighting against this, and we hope that the Peel Region doesn’t try this kind of monkey business. The Ford administration argues that prices will settle accordingly if we base them on the law of supply and demand. The greater the supply of private apartments, the lesser will be the rent. There is a private sector which can be wholly covered by those economic laws. And these sector composed of bank executives, upper-middle and middle class renters can absorb the rents. But there is another sector which comprises at least 10 percent of renters, us who cannot find stable jobs, forced to work part-time, mentally ill, physically disabled, seniors, etc. The Ford administration is not wholly in touch with reality. It presumes that all renters are able bodied people. My mother will require a seniors retirement in 5 years. The costs are unaffordable unless she retires somewhere in the north where we cannnot visit her because there are no public transportation to reach her place. So she will remain solitary the rest of her life. Mayor Ford is also not in touch with reality with respect to his advisors. Some of these are Chinese spies who will selectively choose who among low-income renters will remain in place. Members of Canadian legion, army veterans, retired Conservative and Liberal government employees, together with their mentally ill siblings and senior parents will surely get the ax while supportive members will retain their apartments. I know because I have a neighbour who is an unregistered Chinese spy whose son is advisor to Ford. We all will get the ax. Ford is a moron.- Rainerio Tayco, disabled veteran. But the constructive criticisms I have of Ford does not mean that the opposing party is worthy successor. They too have their own Cuban advisors who will selectively choose worthy apartment dwellers. Usually these people belong to the Socialist and the Communist Party of Canada and its organs. Down with Ford! Down also with David Miller! Who sould be Mayor? Mel Lastman or his sons!! I got an email coming from an advisor to the Secretary of Housing in USA. It shows a list of vacant apartments in Washington DC and its suburbs. Mayor Ford’s arguments look plausible. Browse in forums.military.com/eve. The average rent for a 1 bedroom apartment, 1 bathroom with kitchen is 450 US dollars. They’re gazillion and they’re vacant. But knowing my neighbours, I would not buy that. They’re not lazy. The jobs are just all taken and they live on welfare. Some are selling their bodies on the streets. I dunno. I am a tenant and have been here for 25 years.. since I was 7 years old my family raised me in this house. Growing up in a family where both your parents are blind is hard enough. I then became a single mother and with jobs be scarce in the city of Toronto and not having adequate child care I could no longer keep the job I had. I had to move back in with my parents and they then vacated this house, and so on my own I was left to pick up the pieces. I have raised my children here and I was also raised here, I have life long friends here and a church close by. Now out of no where I’m forced out of what feels like MY HOUSE. I am still in the process of finding work but this just adds to the stress, somethings gotta give!!! Do you know how many memories have been created here and now ROB FORD just wants to rob me of those?! HOW??! HOW??? I entered the wrong email.. this is the correct one. Thanks for sharing your story with us Sarah! These homes should not be sold. You should not have to suffer through this uncertainty and anxiety. We will fight this together. Sarah, I suggest that you file a personal injury lawsuit not only against Toronto Municipal but against Rob Ford as well. We will not only be vindicated but compensated as well. Cheers!